This is the first of the chakras of matter. Balancing the root chakra creates the solid foundation for opening the chakras above. Imagine that you’re laying the foundation for a house in which you’re going to live for a long time. A solid foundation embedded in firm soil will provide the stability you need to create a home filled with joy for years to come. The root chakra is comprised of whatever grounds you to stability in your life. This includes your basic needs such as food, water, shelter, and safety, as well as your more emotional needs such as letting go of fear. When these needs are met, you feel grounded and safe, and you tend to worry less day to day. Whether or not you feel secure now often has less to do with what you have at your disposal and more to do with how safe you felt as a small child. When you consider psychologist Erik Erickson’s stages of development, the first stage—trust versus mistrust—is closely related to your root chakra development. As infants, if your caregivers readily gave you what you needed to survive with consistency, you felt secure in the world. You felt that the world was a place that could be trusted to provide your basic needs. Yet, if your caregivers withheld or delayed in giving you what you needed, or if that giving was inconsistent, you may find yourself with first chakra blockages. While meditation does connect you to a higher spiritual plane, it also serves to ground you. You may not always be able to trust that the world will give you what you need to survive, but connection to your higher self and trust in a power higher than yourself will give you what you need to feel safe. It does not matter if you call that higher power Consciousness, Mother Nature, God, or Spirit. Connection to universal energy will bring you a sense of peace and stability. The animals in the forest have no idea if and when they will find food each day, yet somehow they trust in nature to provide for them. Try this: The sense organ that corresponds to the first chakra is smell. While meditating, focus on the tip of your nose to help align the root and bring forth the qualities you need to balance your root chakra. Women can also practice Kegel exercises, and both men and women can do Bandha yoga—where you lock or tighten certain areas of your body—to help bring strong energy and strength to the area of the first chakra. Chanting or toning sounds can also help bring you back to balance just like music brings people together. Sounds create vibrations in the body, and these vibrations help the cells work together in synchronistic harmony. The mantra sound that corresponds to the root chakra is LAM. Finally, colors and gems can help bring a chakra into balance. 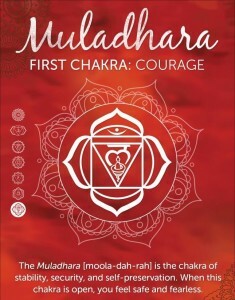 The root chakra’s color is red. Gemstones for the first chakra include garnet, red jasper, black tourmaline, and bloodstone. You can place the gemstone on the area of the chakra while lying down to help open and align it. This is the second article in a series written by Michelle Fondin for the Chopra Centre.